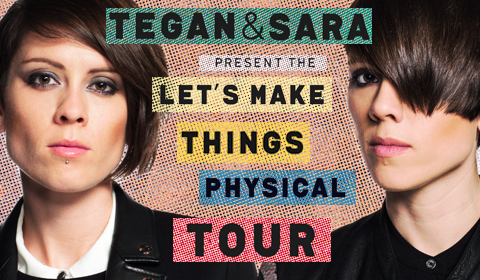 We’re excited to announce our Let’s Make Things Physical Tour happening this May + June in the US! We’re absolutely thrilled to finally be hitting the road to headline our own tour in support of Heartthrob and we want to see you there! One of the best parts of a headline tour is getting to choose which bands will join us on the road! Sharing the stage with us will be Lucius, My Midnight Heart and The Courtneys! Each band has their own unique sound so we think you’ll love the line up we’ve put together. Take a look at the date listings below to see who will be joining us in your town! The pre-sale for all shows starts TOMORROW, February 26th at 10am venue local time. Ticket links can be found at teganandsara.com/shows! Public on-sale will begin Friday, February 28th at 10am venue local time. $1 from each pre-sale ticket purchase will be donated to NYCLU‘s Teen Activist Project. As an extra bonus, each pre-sale ticket purchased through our website will also be automatically entered to win a pair of our T+S Keep shoes signed by us! As you can see, 2014 is going to be a busy year, so we hope to see a lot of you while out on the road!